Sony is a brand which manufacturers quality devices like laptops, Smartphones, Camera and many more electronic devices. Sony VAIO pro 13 is a amazing lite laptop with attractive specifications and this is the world’s lightest ultra book having a price tag ranges from $ 1,300 to $1,500. 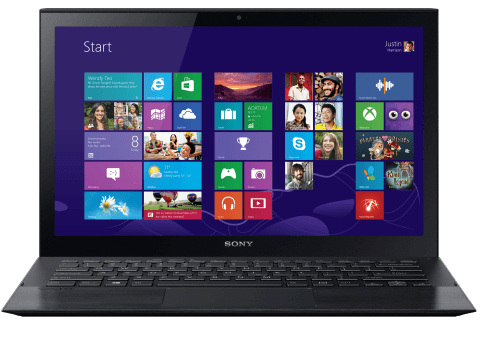 In this article let us discuss the full details of this device Sony VAIO pro 13. Ultra book comes with 13.3 inch display which seems to be bigger than the tablet and has full HD 1920 x 1080 pixel resolution Touch screen LCD with Triluminious display with natural shades of color. This is the multi touch compatible which offers you a nice level of responsiveness but the accuracy is bit dull. This new ultra book weighs lite as I mentioned earlier. The body of the device is made with carbon fiber with a silver paint job which gives you metallic look. This device is powered by Intel core i7-4500U dual core processor, we can say this is the one of the fastest of the new ultra book low voltage processor that can be found in ultra book. The processor is matches up with the 8 GB DDR3 RAM which allows you to run on windows 8 and applications. The graphics of this device is handled by the Standard Intel HD graphics 4400 that are built into the core i7 processor. Sony VAIO pro 13 comes with an internal battery capacity of 4740 mAh, This battery will comes up to six and half hours definitely. You can stretch this time by using the ultra book properly by discharging it correctly and charging it accurately. Actually this ultra book having the longer battery life when compare with previous ultra books. Over all the performance of the system is pretty good, As the device is lite weight we can carry it easily. Even there are some disadvantages like systems becomes hot quickly while running. Finally I can saw this is the best laptop with respective performance.